When it comes to dynamic duos, we prefer our sidekicks furry. The presence of an animal instantly turns the dullest of movies into a classic. Here are the animals we wish could have won "Best Animal" at the Oscars. 1. Toto from "The Wizard of Oz"
Dorothy's feisty little terrier is the animal sidekick who started it all. The beloved showbiz pup even has her own monument at the Hollywood Forever Cemetery. 2. Zero from "The Nightmare Before Christmas"
Zero might just be our favorite ghost dog. He was up for anything, even using his jack-o-lantern nose to guide Jack's sleigh. Every Halloween we start wishing for a ghost dog of our very own. 3. Mr. Bigglesworth from "Austin Powers: International Man of Mystery"
This hairless creature had everyone in the late '90s evilly petting their invisible cats. In addition to being Harry's only friend at the Dursleys', beautiful Hedwig made everyone think it was easy to train an owl to deliver your mail. 5. Dunston from "Dunston Checks In"
Sure, this movie only has a 6% "fresh" rating on Rotten Tomatoes, but it's a winner in our book. All you have to do is glance at Duston's adorable mug to realize he's a star. 6. Binx from "Hocus Pocus"
Technically, Binx is a boy who's under Bette Midler's curse, but who cares about details like that? Binx is sassy, lovable and had lots of kids hoping that the stray cat in their neighborhood might one day start talking to them. 7. Joey from "War Horse"
Besides being a total stud, Joey is probably the only horse that can make grown men cry. 8. Baby from "Bringing Up Baby"
This movie taught us that the best way to catch a man is actually with a leopard. Just tell him it's lost, and then send him on a madcap hunt to look for it! 9. Cat from "Breakfast at Tiffany's"
The only time the world ever turned against perfect Audrey Hepburn is when she threw this adorable kitty out into the rainy streets. 10. 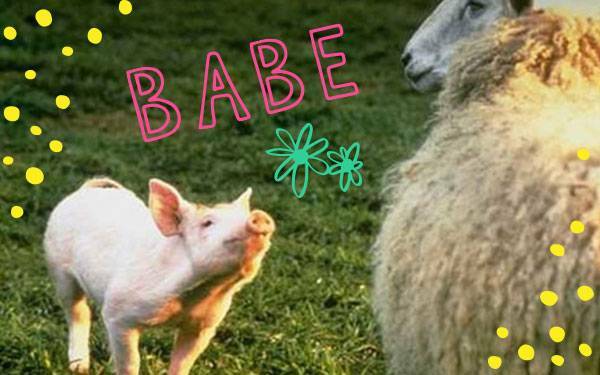 Uggie from "The Artist"
OK, he's not technically a sidekick, but this adorable pig saved his own bacon—and that of his fellow farm dwellers—so many times that we were left wondering what Hoggett Farm would've done without him. These animals all clearly catapulted their films into a new stratosphere of awesomeness, so how 'bout a little recognition, Academy! ?